An ongoing debate has been unfolding among the public and medical professionals about whether the healthcare reform bill really requires mandatory counseling for every senior that will steer them to make advance healthcare decisions that could end their lives sooner, perhaps in order to lower healthcare costs. While quick reactions have come from both sides of the issue, few people have read the bill and understand what it says or what the words really mean. Even fewer know the history and objectives of the stakeholders behind this section of the bill. In talking this weekend with other nurses who’ve worked in intensive care and faced ethical questions surrounding life and death for much of our careers, the repeated comment was how few people even know what’s happening, even though they will soon find their ethics put to the test in ways they never imagined. The issue is far too big to cover comprehensively in a single blog post, but links to historical perspectives and a few resources will hopefully give all of us cause to pause and think. 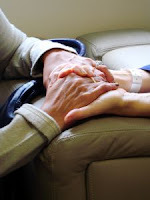 `(E) An explanation by the practitioner of the continuum of end-of-life services and supports available, including palliative care and hospice, and benefits for such services and supports that are available under this title. `(IV) is guided by a coalition of stakeholders includes representatives from emergency medical services, emergency department physicians or nurses, state long-term care association, state medical association, state surveyors, agency responsible for senior services, state department of health, state hospital association, home health association, state bar association, and state hospice association. (2) A practitioner described in this paragraph is--`(A) a physician (as defined in subsection (r)(1)); and `(B) a nurse practitioner or physician's assistant who has the authority under State law to sign orders for life sustaining treatments. `(3)(A) An initial preventive physical examination under subsection (WW), including any related discussion during such examination, shall not be considered an advance care planning consultation for purposes of applying the 5-year limitation under paragraph (1).`(B) An advance care planning consultation with respect to an individual may be conducted more frequently than provided under paragraph (1) if there is a significant change in the health condition of the individual, including diagnosis of a chronic, progressive, life-limiting disease, a life-threatening or terminal diagnosis or life-threatening injury, or upon admission to a skilled nursing facility, a long-term care facility (as defined by the Secretary), or a hospice program. `(4) A consultation under this subsection may include the formulation of an order regarding life sustaining treatment or a similar order. `(iv) may incorporate any advance directive (as defined in section 1866(f)(3)) if executed by the individual. `(iv) the use of artificially administered nutrition and hydration.'. (2) PAYMENT- Section 1848(j)(3) of such Act (42 U.S.C. 1395w-4(j)(3)) is amended by inserting `(2)(FF),' after `(2)(EE),'. `(P) in the case of advance care planning consultations (as defined in section 1861(hhh)(1)), which are performed more frequently than is covered under such section;'; and (B) in paragraph (7), by striking `or (K)' and inserting `(K), or (P)'. `(A) IN GENERAL- For purposes of reporting data on quality measures for covered professional services furnished during 2011 and any subsequent year, to the extent that measures are available, the Secretary shall include quality measures on end of life care and advanced care planning that have been adopted or endorsed by a consensus-based organization, if appropriate. Such measures shall measure both the creation of and adherence to orders for life-sustaining treatment. `(B) PROPOSED SET OF MEASURES- The Secretary shall publish in the Federal Register proposed quality measures on end of life care and advanced care planning that the Secretary determines are described in subparagraph (A) and would be appropriate for eligible professionals to use to submit data to the Secretary. The Secretary shall provide for a period of public comment on such set of measures before finalizing such proposed measures.'. Did you get all that? Of course not. It’s mostly gobblety goop and legalese, with repeated edits and references to other laws that makes it next to impossible for most anyone to comprehend. But, as the Bioethics Defense Fund has concluded, this broad and vaguely written bill is wide open to being interpreted as giving the government the power to require all Medicare recipients to receive advance care consultations and giving the government the unprecedented authority to define exactly what such counseling must include, who can deliver it, and when it must be given. More importantly, it is clearly an effort to coerce seniors to sign such an order. There are multiple loopholes that open doors for its misuse, and abuse of the elderly, while also including no protections for these patients. Claims that it is not mandatory are most obviously not supported by the bill’s language. It directs healthcare providers that they “shall” ensure every Medicare patient receives such counseling every five years. “Shall” means must. Those directives are to become part of the patient’s medical records. The most telling evidence that it will be mandatory is the Expansion of Physician Quality Reporting Initiative provision that makes advance care planning a reportable Pay for Performance measure for every professional providing services to Medicare patients. “Such measures shall measure both the creation of and adherence to orders for life-sustaining treatment.” Worse, those measures reportable to the government will be defined and determined by the Secretary of Health and Human Services. Electronic medical records will enable governmental oversight of physicians’ and patients’ adherence and identify those who are noncompliant. It says that at each counseling session, the healthcare provider must provide patients and their families with a list of outside advance planning organizations and resources, and explain the benefits of their end-of-life services and why signing an order is beneficial to them. The end of life discussions at the initial preventive physical exam, mandated for every Medicare recipient upon enrollment, doesn’t count towards the five years. And anytime there is a change in their health, a diagnosis of a chronic, progressive or life-limiting disease, or diagnosis of a terminal illness or life-threatening injury, or admission to a nursing care or long-term care facility, they may receive the counseling again. Note: This would define all chronic diseases of aging, which means seniors could receive relentless counseling about the benefits of and need to plan their deaths. Every consultation can result in an actionable medical order about life-sustaining treatment, says the bill, one that is signed by the doctor. Note: It makes no provisions that the patients must consent to these orders or that the doctor writing these orders must be the patient’s own personal healthcare provider. ● Add a provision stating that the counseling is entirely voluntary–both for the patient and the medical provider. In that way, the regulations–that will be thousands of more pages–promulgated by the agencies to further the purpose of the law won’t be able to require counseling. ● Add a provision stating that the patient will not lose benefits if he/she refuses counseling or does not sign an advance directive. ● Add a provision that no service provider will lose compensation for not providing counseling. Look at those closely. In other words, this legislation leaves the door wide open for the government to deny seniors medical care or take away their benefits if they don’t sign a directive and it gives the government the authority to withhold a doctor’s compensation. Intimidation of seniors at the most vulnerable times of their lives? Clearly. But the most critically important provision — and what should be the most deeply concerning to every American — are the compulsory referrals of patients to outside organizations that not only may, but do, have strong ideological agendas. THIS is why it is so important for medical professionals and every consumer to understand this legislation and its history and what is included in these counseling sessions. The outside groups that have positioned themselves as the end-of-life experts and that have been doing the end-of-life education at academic centers across the country have been being closely followed and opposed by medical ethicists for decades. These are the ones who will (and already have) become the outside counselors and providing the approved counseling materials and registries, as mandated by this legislation. This legislation is the culmination of efforts since 1938 to change what the public would once have viewed as morally repulsive into something accepted. There are a number of papers that have documented this history in detail. Let’s first look at the report that formed the basis for this legislation, and then at a paper which helps decode the terminology. 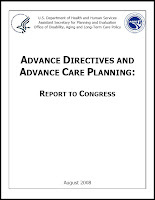 The report this legislation was written from was “Advance Directives and Advance Care Planning: Report to Congress,” published last August. It was written by RAND Health, a division of RAND Corporation, and the HSS. RAND Health is under the direction of Dr. Robert H. Brook, M.D., who heads the Robert Wood Johnson Clinical Scholars Program at UCLA, and is sponsored by Robert Wood Johnson Foundation, along with other foundations, pharmaceutical companies, managed care companies and governmental agencies. This report was commissioned to map out how to promote advance directives and planning for end-of-life care on a national level and to identify the barriers and legal issues. As it noted, legal cases during the 1970s and 1980s surrounding withdrawing life support resulted in the increasing adoption of state laws. Since the 1990s, efforts have ensued to create a national model and legislation requiring all health care facilities receiving Medicare or Medicaid funding to provide information on advance directives and to incorporate those directives into the medical records. The report noted that disability rights activists have raised concerns “that advance directives and withdrawal of life-sustaining care, when combined with ‘biased and inaccurate views of many disabled patients’ quality of life held by the non-disabled, encourage less aggressive care and withdrawal of life-sustaining treatment, permitting persons with disability to die earlier then warranted.” A history of social and economic discrimination of persons with disability contribute to these concerns. The strongest concern, however may be the view that the quality of life of some disabled person is less preferable than death or “at least not worth using life-sustaining treatment to achieve or preserve,” said the report. “The disability community also raises concerns that biases about quality of life translate into reduced clinician efforts to maximize patients’ quality of life, which in a self-fulfilling manner causes patients to accept less aggressive care. Major life activities include seeing, hearing, speaking, walking, breathing, performing manual tasks, learning, caring for oneself or working. Examples of disability so defined include a seizure disorder, paralysis, HIV infection, substantial hearing or visual impairment, cognitive developmental disability, or a specific learning disability. Based on this definition, 20 percent of the United States population — more than 50 million people — has a disabling condition that interferes with life activities. Social marketing, it explained, is designed to bring about social change using concepts from commercial marketing and has proven effective in achieving widespread acceptance of behavioral changes in other health issues. It recommended using social marketing to make a public case for advanced care planning. It exampled the 1995 national social marketing campaign, Last Acts, funded by RWJF, that included more than 1,000 groups across the country. It worked to build coalitions and change the culture in healthcare institutions and change cultural attitudes about death and dying. Another social marketing campaign exampled was the Hawaii state program, Kokua Mau, also funded by RWJF together with foundations, the state and insurance companies. The report also examined the benefit of Health IT (electronic medical records), including electronic prompts, computer-generated reminders and forms, to influence physician practices and increase compliance. At roundtable discussions of legal and social marketing initiatives, held in Washington, DC on October 22-23, 2007, it specifically recommended end-of-life planning be incentivized by making it a pay-for-performance (“quality”) measure. Hospitals would be graded on their adoption of measures and it even recommended that poor advance care planning be seen as a medical error, in violation of standards and requiring “remedy.” Any doctor who fails to comply could jeopardize their license. According to RWJF, the University of Hawaii Center on Aging, a member of Kokua Mau, reported that the number of advance directives completed by seniors in Hawaii had increased by 10 percent between 1998 and 2000. Most notably, hospice admissions increased 20 percent from 1999 to 2001, and referrals at the state's largest hospice increased 48 percent during 2002. The program had effectively led those seniors to forgo medical treatment, saving managed care providers an undisclosed amount. As RWJF explained, between 1997 and 2003, it funded a national program called Community-State Partnerships to Improve End-of-Life Care, authorizing $11.5 million for the program. That was after its earlier Last Acts coalition and its $28 million project in 1995 called Study to Understand Prognosis and Preferences for Outcomes and Risks of Treatment (SUPPORT), which had claimed “most Americans die in hospitals, often alone and in pain” and was used to garner support for assisted suicide programs. As RWJF said, states had been the focus of the physician assisted suicide debate during the 1990s after the headline case of Dr. Jack Kevorkian, and it had funded programs in Maryland, Florida, Colorado and elsewhere, before deciding it didn’t want to fund more ad hoc efforts and preferred a national program to bring cohesiveness to their efforts. This article was first published in the Duquesne Law Review in the fall of 1996 and may be one of the most important things you’ll read to help better understand the verbiage used in the Healthcare Reform bill, as well as in media on this issue. Words can often mean something very different from what we think they do, and even from what they meant a few years earlier. Not understanding how words are used can do more than hurt, authors Rita L. Marker and Wesley J. Smith wrote, they may kill. Regardless of one's views about assisted suicide and euthanasia, an understanding of the words used when they are discussed is vitally important. This importance is underscored by a changing relationship between patients and health care providers, a relationship increasingly characterized less as a patient-physician relationship and more as a consumer-provider transaction. In practice, the consumer/patient and the doctor/provider are often placed in a position subordinate to that of the managed care bureaucrat. Health care consumers deserve and desperately need to know how definitions have changed, and they have a right to know that these changes can affect them profoundly. This important article, traces how the meanings of words have shifted, forming new patterns of thinking — words like ‘terminal’ (which laypeople wrongly think means that death is unavoidable and very close); ‘treatment’ (which has morphed from care given in efforts to cure or ameliorate a medical condition to come to mean prescribing fatal overdoses and lethal injections); and ‘comfort care’ (where a prescription for a “drug overdose, legally prescribed” is now called “comfort care” and, according to Oregon’s Medicaid director, is covered under Oregon’s Health Plan). Considerable verbal engineering, they explained, has transformed foods and fluids that had been sustaining life to be called a ‘treatment’, and removal for nonmedical reasons with the intent of causing death called 'withdrawing treatment'. The simple procedure of providing foods and water by a gastrostomy tube has been around for more than a century, they wrote, and at least 848,100 people a year in the United States are on these feedings for a period. “Yet, in the debate over food and fluids, this simple procedure has been described [by proponents of assisted suicide] as one which is highly invasive and highly risky,” they said. By the time the 1990 case of Nancy Cruzen had been decided, right-to-die advocates had already expanded the withholding foods and fluids to include any oral feeding, by spoon or on a lunch tray. “A tray of food is considered treatment,” according to the 1996 guide to end-of-life options by the Euthanasia Educational Council (now called Choice in Dying). There are several articles that have chronicled the evolution, money and people behind the assisted suicide and death with dignity organizations. It’s especially helpful is to see the various mergers and changes in the names of the groups between 1938 and today; the changes in the arguments used to slowly bring the populace to accept killing even of babies born with disabilities, terminally ill and elderly; and to follow the legal and legislative efforts that have brought us to this point. These groups all preach dignity, choice, rights, compassion, mercy, but the common denominator is their origins in the Hemlock Society and Euthanasia Society, including legalization of euthanasia. Marker, along with many others, believes the assisted suicide and euthanasia movement often refers to the "right-to-die" or "death with dignity" and that this movement seeks legalization of mercy killing via a two-step process: the acceptance of assisted suicide, and then, a shift to active euthanasia. Another must-read article detailing the history of assisted suicide organizations, their name changes, spin-offs and mergers, was published by the International Task Force. “After sixty-six years, and after using many different names and approaches, euthanasia organizations in the United States could point to Oregon as the only state where their goal had been met.” This article also explored ethical debates that have taken place over the years. At a 1994 debate, for instance, the murder of a disabled girl by her father was excused by the director of Choice in Dying and used to support the need for physician assisted suicide. This is not to negate their strong support for pain management and palliative care (as traditionally defined) for terminally ill patients, they added. That is inherent in the ethical and compassionate care of patients by all doctors and nurses. Physicians profess devotion to human health and healing… This devotion to health and healing necessarily requires the cultivation of particular virtues, such as self-restraint, patience and sympathy. More to the point, devotion to health and healing sets certain limits on the physician's conduct, chief among which is the prohibition against physicians killing or helping to kill their patients. The international medical community rejects physician-assisted suicide as well. Physician-assisted suicide, like euthanasia, is unethical and must be condemned by the medical profession. Where the assistance of the physician is intentionally and deliberately directed at enabling an individual to end his or her own life, the physician acts unethically. The nursing profession has long been bound by similar medical ethics. “Historically, the role of the nurse has been to promote, preserve and protect human life,” they wrote. “The Code for Nurses states that respect for persons extends to all who require the services of the nurse for the promotion of health, the prevention of illness, the restoration of health, the alleviation of suffering and the provision of supportive care of the dying. The nurse does not act deliberately to terminate the life of any person,” according to the 1994 American Nursing Association, Position Statements: Assisted Suicide. What isn’t widely understood is that hospice care and existing legislation, not to mention medical ethics, already call for pain management and measures to reduce patient suffering, ensure their comfort, and that their wishes are followed. Palliative care as is being used in legislation has become a broad term that can mean something quite different. As Stanton J. Price, a health lawyer and member of the Los Angeles Country Bar Association’s Bioethics Committee, wrote last August in the Los Angeles Times, legislation by Compassion and Choices is a legally confusing solution to a nonexistent problem and is merely a way to open the door to assisted suicide. If you don’t think that a government counselor could ever advocate that elderly people should end their lives because they are a burden on the government’s healthcare system and have a duty to die, then you may want to read the advise given by Lady Warnock, who became Britain’s leading moral advisor and chaired the landmark Government committee on fertility treatment in the 1980s. Last September, in a Church of Scotland’s magazine, she said “pensioners in mental decline are ‘wasting people's lives’ because of the care they require, and should be allowed to opt for euthanasia even if they are not in pain.” Because of the strain they put on their families and public services, she said, they should consider ending their lives. “If you're demented, you're wasting people's lives – your family's lives – and you're wasting the resources of the National Health Service,” she said. She added that she hoped people will soon be “licensed to put others down” when they are unable to look after themselves. Her suggestions received widespread condemnation by medical professionals. What was disturbing was to read some readers writing in support of her ideas. “In the wrong hands,” he wrote, “end of life counseling could easily be subtly or overtly outcome directed.” It all depends on how it is done. If it’s done by a counselor who thinks seniors or sick and disabled people are burdens on the healthcare system and wasting resources for everyone else and should be helped to die, it gives a very different take on whether it is benign. And who are the groups that have positioned themselves as end-of-life experts and service providers, and have been creating the end of life academic curriculums for medical professionals across the country? The groups funded by the Older Americans Act of 1965 and most likely to also be on the list of those resources to be given seniors and their families to assist them with advanced planning. They will be those counselors for us and our loved ones. 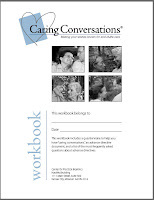 Smith exampled the advance planning workbook published by the Center for Practical Bioethics, called Caring Conversations. ● I always expect to be given care and treatment for pain or discomfort even if such care may affect how I sleep, eat, or breathe. ● I would consent to, and want my agent to consider my participation in federally regulated research related to my disorder or condition. ● I want my doctor to try treatment/interventions on a time -limited basis when the goal is to restore my health or help me experience a life in a way consistent with my values and wishes. I want such treatments/interventions withdrawn when they cannot achieve this goal or become too burdensome for me. This is the default directive and to disagree requires the patient to “draw a line through the statement and put their initials at the end of the line,” he said. It’s even worse than that. An entire second page lists these default directives again and says that if you only want to name a Durable Power of Attorney for Healthcare Decisions, you have to draw a large X through the entire page, then sign the back of the page even if you don’t want to appoint a Durable Power of Attorney for Healthcare Decisions. But there is no place to sign on the back of the page. Confusing? Misleading? You bet. Is this what we want for ourselves, our parents, grandparents and loved ones? As an ethical society and compassionate people, we have a responsibility to educate ourselves, understand history, and consider the consequences of what we allow to happen or choose to condone. When I first read Karen Ward’s article, several years ago, the passage that most affected me was when she said that against major foundations with billions of dollars and that have “embedded themselves in every level of healthcare, government and society…the average American, you and I, has no such advantage to change policy. Our only tools are our telephones, computers and the U.S. Postal Service.” All we have is our strength in numbers and our voices. As hard as all of this is to believe, what is happening isn’t wacko conspiracy theories — this is in our own governmental legislation, in our medical and nursing journals, in public reports from foundations, and in mainstream media that every citizen can read for his or her self. No American can ever claim that they didn’t know what was happening — only that they didn’t care enough.